Abstract: The AD77 Infinity has all sorts of "goodies" such as Serial ATA, USB 2.0, IEEE 1394, 10/100 LAN, 5.1 audio and 8x AGP. 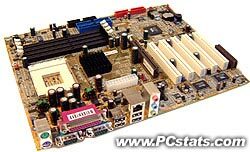 In the latter half of 2002, AMD really slowed down in terms of technology advancement - chip release slowed, and even motherboards supporting AMD processors seemed to be all but forgotten. This slowdown was mainly due to AMD's 0.13 micron manufacturing and supply problems, but things seemed to come to a halt. Now that AMD has solved their initial teething problems with 0.13, the future for them and their partners seems a lot brighter. Barton is just around the corner and AMD's long awaited Hammer line of processors will finally debut sometime in the spring of 2003, possibly even as early as March. 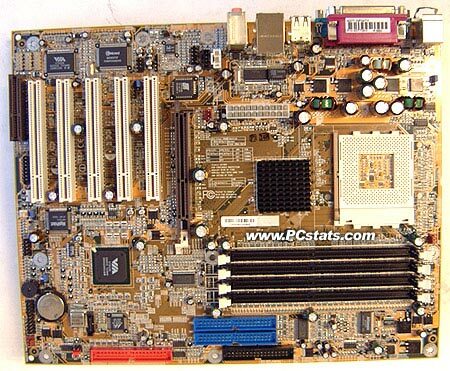 Today we're going to check out DFI's latest KT400 based motherboard; the AD77 Infinity. The AD77 Infinity has all sorts of "goodies" such as Serial ATA, USB 2.0, IEEE 1394, 10/100 LAN, 5.1 audio and 8x AGP. If that's not enough for you, there are four DIMM slots which support up to 4 GB of either PC1600/2100/2700/3200* (* - PC3200 support is unofficial) and five PCI slots should you need to install more devices. DFI have also included the ever useless CNR slot, which is mainly for OEM's. Lastly, the DFI AD77 has support for any current AMD Athlon/XP 200/266 or 333 MHz processor. As you can see, the AD77 Infinity is quite plain looking - DFI were never into any fancy coloured PCB's, they know that performance and stability are far more important then flash. The layout of the AD77 Infinity is very good, the main IDE and floppy connectors are in the most ideal location to the right of the DIMM slots. Even the extra IDE connector will not get in the way of most consumer PCI devices. Like only a very few number of manufacturers out there, DFI places all the connectors (USB, IEEE 1394 and the game port) at the bottom of the motherboard. This is extremely helpful in keeping the cables away from the other system devices. We're impressed by how well the "little things" are done right with the AD77 Infinity. The board is very well labelled, you not have to refer to the manual when setting up or installing any devices. If you don't know what a certain jumper does, DFI will have an explanation somewhere on the PCB. All three fan headers are easily accessible and with more and more people using third party GPU coolers, it's nice to see DFI place a fan header just above the AGP slot. It was nice to see that DFI took some extra care around the CPU socket. Under the CPU retention clips are pieces of plastic that shield the PCB on both sides. 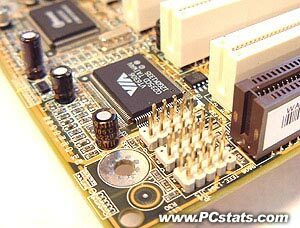 With clipping heatsinks require more and more pressure to install them, this ensures that you don't damage the motherboard when installing the heatsink. DFI also included a four diagnostic LED's. This seems to work very similar to MSI's DLED and works on the same concept as a Port 80 card. Unfortunately DFI forgot to include the necessary information to decipher the codes. After a bit of use though, you'll get an idea of what they mean though. While this is a good step in the right direction, we would have prefer DFI just use a Port 80 card instead. Pg 8. So what do we think?